Ahh spring! That time of year when a young man’s thoughts turn to one thing…and since this is not the forum for that topic…let’s talk tools. Officially, I think this silly little woodworking hobby of mine has morphed into a full blown obsession. In fact, if I ever sell my home, the listing will probably read “Beautiful, three bedroom, two bath home with a Five-tool garage”. While I haven’t reached the absolute low of selling myself for money to feed my tool addiction, I have taken the first step by admitting I do have a problem. The latest proof is my “new to me” Jet JJ-P12 jointer/planer combo machine. Allow me to begin the review with some caveats, just to ensure fairness. Previous to this purchase, the shop was equipped with an early model, 6 in Delta Jointer and a 12 inch Grizzly lunch-box planer. Both performed the tasks they were designed for but took up valuable floor space. My longing for more shop space and the ability to joint boards wider than 6 inches eventually proved too strong to ignore. I drooled over the combo machine from Hammer that a friend had in his production shop but just could not justify the price. The idea of a combo machine, however, stayed embedded in the dark recesses of my mind. Enter Craigslist and some luck. While perusing listings, I came across one that read “Jet JJ-p12 jointer/planer, never used and still in the crate”…and to top it off, the seller was asking for just under half of what it sold for new. I took a chance and made the purchase. It did appear unused; the unit was still bolted on the crate, no plug was installed and cosmoline still coated all exposed cast iron. I even talked the seller down an extra $150, since there was no way to actually test the machine when I purchased it. Apparently, the seller’s wife told him “it’s either me or the tool.” Now I know what you’re thinking…you’re thinking if you were the seller, you would have said…”Well Honey, it’s been nice knowing you”. Go ahead and laugh…I’ll wait. …so to me, the ribbed surface is neither a hindrance, or a benefit. The instruction manual I was told, was thorough. But what brought me the biggest smile was the ability to joint wide boards and the single foot-print the unit affords. Now the Hate: My initial use of the device was to joint and plane boards that were fairly narrow…less than 6 inches wide. When I finally got around to milling a wide board, that’s when issues arose. During jointing, the chip extraction was brilliant. In fact, almost no chips or dust were left on the beds even after several passes. But during planning, the accumulation of chips was so bad, it prevented the work piece from sliding through. Also, the feed roller on the out-feed side, appeared to be slipping, and barely turning at all. So I lamented and dug out the instruction manual, an act that goes against every fiber of the male brain, being fairly certain that I would find the solution there. Nothing…nothing at all as to indicate, direct or otherwise instruct one on how to ensure proper dust collection or roller set-up. A call to Jet’s technical support, while being a pleasant experience, proved unhelpful. The technician was very polite but could not send a replacement dust-shroud without a large cost, since the unit was purchased second hand. I fair decision in my mind. But upon Further Review… I’m a tinkerer. And growing up with a father who has two engineering degrees, it’s in my DNA to figure out these puzzles. What I found out was that the feed roller on the out-feed side was too high. A call back to the technician yielded an ideal setting of 1/32 of an inch below the knives; while mine was almost 1/16 of an inch above the knives. It was no small task to adjust it either. There was no instruction in the manual, only an exploded diagram. But with a few socket and crescent wrenches and an hour of time, I had it adjusted. Housings covering both ends of the roller had to be removed, along with a couple of gears. 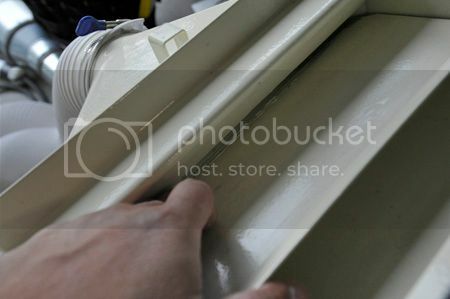 And turning bolts evenly on both ends of the roller to ensure it was parallel to the knives also proved to be tedious. The other issue was the dust collection. When I took a closer look at the dust shroud, I discovered that an internal baffle the redirected the air flow to improve efficiency was actually PAINTED SHUT! Are you kidding me??? 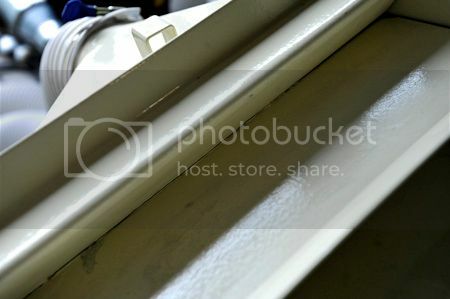 The seam was so thick with paint, it almost appeared as if it was welded that way. There is no mention of this baffle in the manual at all, and no photo either. I snapped one for your viewing pleasure. Scoring the painted joint with a utility knife and a slight tap with a mallet released the baffle. Apparently, it’s gravity activated when you switch the dust shroud from jointer to planer mode and vice versa. Back to Love: After all these fixes, I have a machine that I absolutely love. The dust collection in both modes is very efficient, now that the baffle has been set free. I went from having trepidation that I made a bad choice, to feeling that I would make the same decision in a heartbeat. Since I saved a lot of money on the tool, I upgraded the adjustment knobs on the fence to Cam-lock style knobs; a really practical solution in my opinion and a hint to anyone from Jet’s design team who might be reading. Now, would I have been as happy if I had paid full price for the unit?…absolutely not. A tool this expensive should have had a better fit and finish (no painted-shut baffles), come with a better instruction manual, and have been better adjusted from the start. Rating this tool is difficult. I’ll use the sellers word and the other clues and assume that the device was new. I’ll also let it have a pass on the adjustments because all adjustments could have been thrown off during the transport of the unit to my garage. For a new unit, it would have been nice to have a working baffle, and a more detailed instruction manual would have been nice. But now that all is adjusted, the unit works fantastic in both modes and to have both in one footprint is awesome. Three and a half stars seems to be fair. So if you own one of these units or are thinking about owning one, I hope this info finds its way to you and ultimately has some value. If I had been clever enough to check Lumberjocks for a review on this jointer earlier, I would have saved myself some mental anguish for sure. Now…what’s that next step of that 12 step addiction program…. 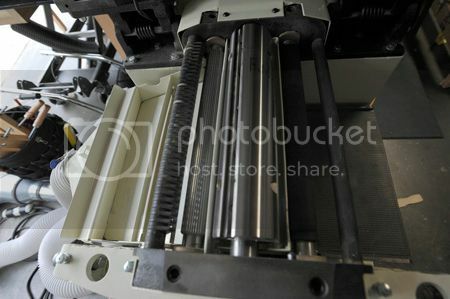 I got one of these a couple of years ago, but with the helical cutter head. My previous planer had been an old (1982) Rockwell/Invicta 13” machine that was probably the best planer I’ve owned, especially with the reliable way it fed the stock. But it howled like a banshee, though not as badly as the Dewalt 735. I actually disassembled it to get specs for a custom cutter head from Byrd, but hesitated because I knew I’d never get my money back out of it—not that I usually let that be a primary concern. There’s a Jet-Powermatic outlet in Auburn, WA (between Seattle and Tacoma) that regularly advertises on CL. These tools are always “scratch and dent,” though the planer/jointer I got didn’t have a scratch on it. The employees surmised it might have been a demo at a trade fair, but the cord didn’t look as if it had ever had a plug on it. I have generally been very pleased with it. I added a Wixey gauge to make switching between jointing and planing functions go easier, and have worked out a way that avoids having to move the dust collector hose when switching functions. Your comments on the outfeed roller are interesting to me, because at times I’ve felt I wasn’t getting quite the robust feeding I had gotten used to (though that has sometimes been an issue on other planers I’ve owned). I’ll check that out. One reason I wanted the helical head (aside from the ease in maintaining sharp cutters at all times) was the quieter operation. The difference is significant and really worth it. My price, with the helical cutter head? $1800, which was quite a bit less than Grizzly’s combo machine with spiral cutter head at the time.time. I never had one of this but I had a 5 operations combination machine with 3 electric motors on..
Like you do, I love the space saving but after a while switching from one operation to the other really become a pain. One thing I really liked, was that the planer could plane as tall than it could wide (300mm in each direction) thing impossible to to with most planers. Very cool…. I want one. What’s ya pay for it? Nice write up. You should post more on here, that was entertaining. Rob , they have the same unit at the TechShop in San Jose and I have used it severeal times and have not found the switchover to be a problem at all after you do it a couple of times it is very fast and easy. They have the helical cutter head on it and and as far as I am concerned you will never want to go back to straight after you use one. I actually have had the machine for a little over a year but just now got around to posting the review. I chose this unit over the grizzly because of the change over..it’s pretty smooth. Since the tables move together and you don’t have to remove the fence, the change is fast. I have not seen any movement in the alignment of the beds durning the change over either. You do have to make sure the beds are locked down, the look like they are even if they are not…so u havee to confirm they’re locked by pushing the lock handles down..if they move at all..it wasn’t locked. I will probably pull the trigger on the spiral cutter head here in the next few months so I’ll let you know how that install goes. I ordered a wixey digital height gauge too just because the standard gauge is archaic. Feel free to PM anytime with more questions. @Richard thanks for your response and welcomed info! @Lildrgonfib01 once again thanks for taking the time to share the additional info. It is good to know that this machine is living up to your expectations and others ! It will make my decision that much more educated and easier to perhaps pull the trigger when the time comes. Also thanks for your your continued willingness to help with ?’s down the road! This unit looks great. Out of my current budget, but it seems like a good thing to save up for. A question for those who own combination machines, either a jointer/planer, or any of the euro-style 5-in-1 or similar … presumably a major factor choice to own one of these machines is shop space, so for a shop with “enough” space (does such a thing exist? ), would these still be a good buy? The type of projects that interest me, at least in the short term, are making small decorative pieces like boxes, or small furniture, as well as built-ins and cabinetry for my house. A type of project I really enjoy is veneering and working with highly figured wood. If I were to go out and buy a jointer right now, I would probably go for a 6” long-bed model with a helical cutterhead. But a 6” jointer can’t true up a wide figured board for resawing into veneer slices. A stand-alone 12” jointer is going to be way out of the price range that I can justify considering this is a hobby for me. But it seems like the jointer-planer combo machines can satisfy this type of work without costing an arm and a leg. Do units like the JJP-12 do as good a job as their stand-alone companions? ACME Tool has a 15% off that is good for Jet…I am about to pull the trigger today before the sale ends. Can anyone explain why the straight knife version is $2300 and the helical head version is $3,430??? Waiting on Grizzly to get anything is stock is getting ridiculous! I would just buy the straight knife version and buy a byrd or jet HH later for less money. Any opinions ASAP would be greatly appreciated!